Seafood has been one of my very recent craze! By recent I mean, maybe, some 3-4 years...If you had met me then, I would have been gutted at the sight of somebody eating seafood. Well, gutted might be an overstatement here, but it's certainly, because I was a vegetarian at that time..
"there's no bigger carnivore than you"..."can't be!!" Well, I don't blame her, and agree to every single word, they've been rightly used! But that wasn't everything! No my dear! "How can you eat mussels? Or oysters?" "What is it about them, that is so appetising to you? Huh?" And apparently oysters and mussels are men's food? Anyways! You've found the very essence of today's recipe! 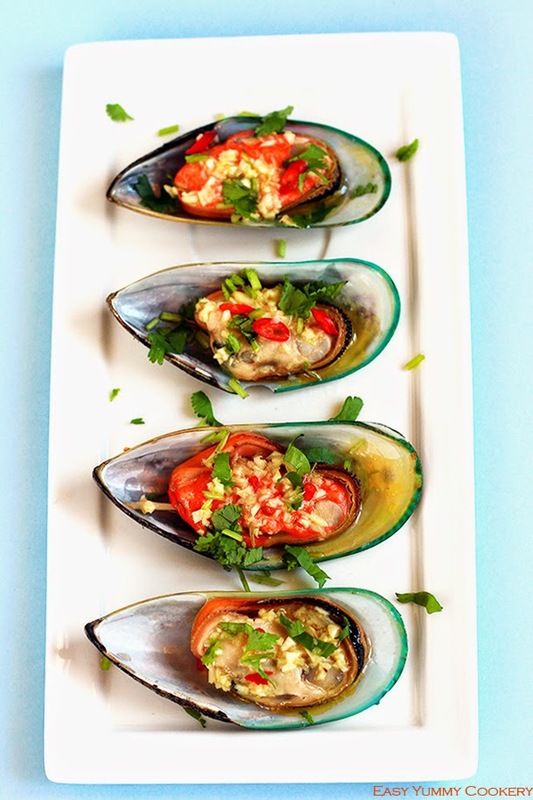 Oven Baked Garlic Butter Mussels. I was walking down the aisle of the fresh and cold section of Sik Yuen when I noticed that the Talley's Greenshell Mussels were selling for less than usual! My hand reached out for a box before I knew! And because I couldn't wait to cook something out of them..I decided to bake them with some garlic butter sitting on top! That is the quickest and easiest yet delectably yummy thing you can do to seafood! Even when they were in the oven I couldn't wait until when I would finally be able to dive into those shells, get the juicy flesh out of it and let the garlic butter taste linger on my taste buds! Oh! Please allow me to give you the mum's feedback!! 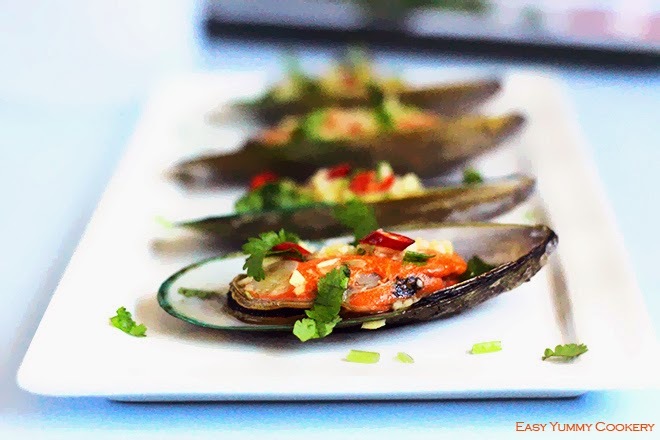 "It tastes yummy, very yummy indeed..the right ratio of garlic to butter, not too spicy and the coriander leaves add a subtle flavour too"
Oven Baked Garlic Butter Mussels - Buttery, Garlicky, Slightly Spicy and are ready in 8 minutes! Yes, it's the perfect quick starter! If you've never had mussels before I urge you to try...please...atleast once! 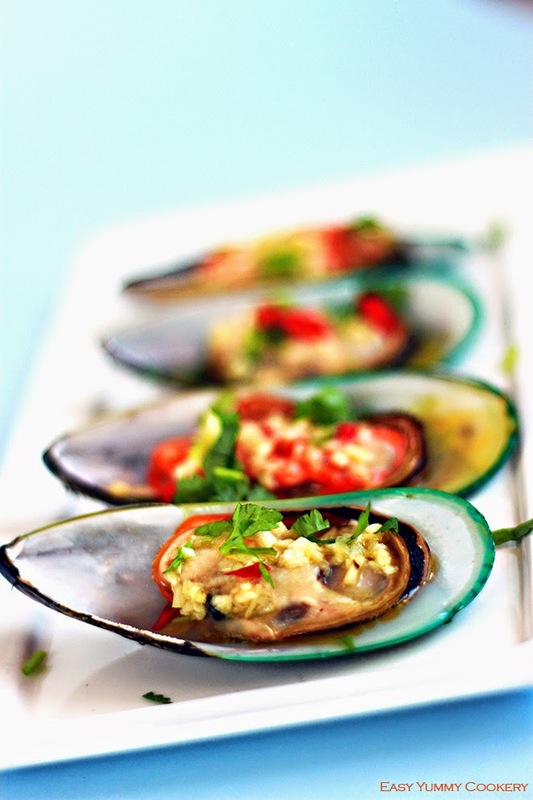 This recipe will make you fall in love with mussels! 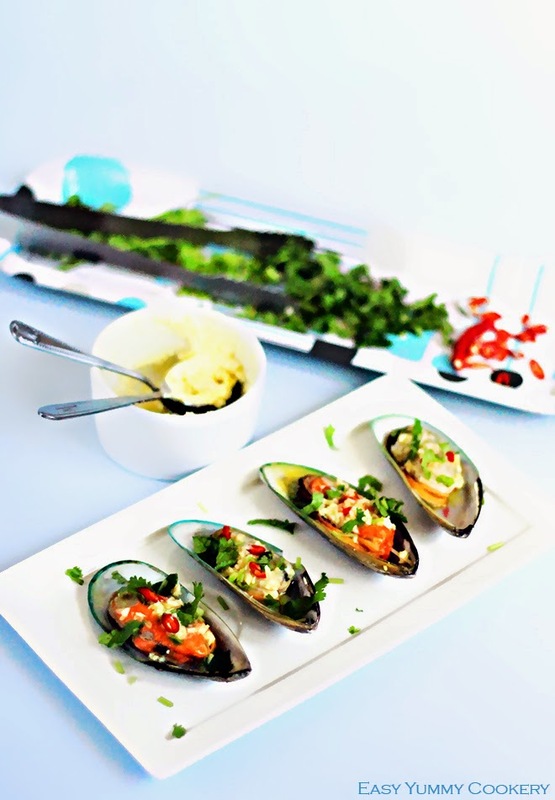 Mussels are very high in protein. Amongst all shellfish, they provide the most nutritional values. They are specifically a rich source of vitamin B-12. So if you're like me, and aren't a big fan of red meat, which provides the B-12 vitamin, you've got one healthy and yummy alternative - mussels!!!! 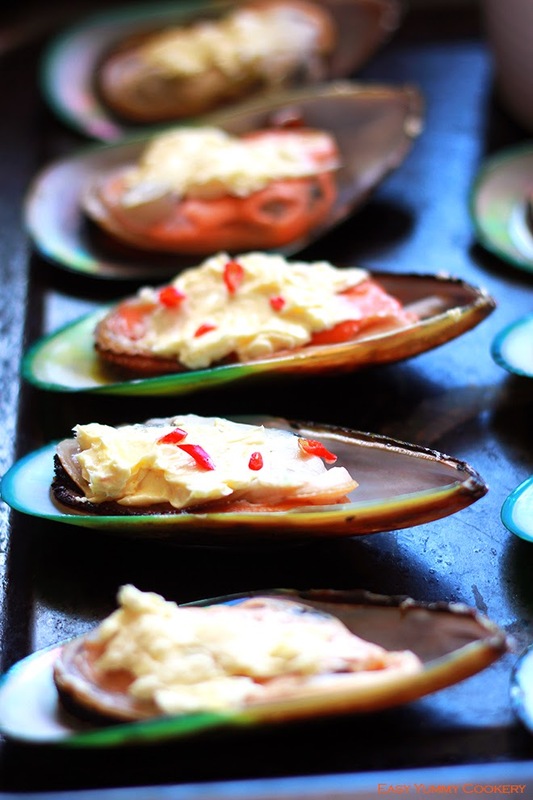 Arrange the mussels (raw side facing up) on a baking sheet. Combine the chopped garlic, the butter, lime juice and pepper together. Mix well until everything blends together and the butter is creamed. You might want to use a whisk for that. Drop a small dollop of the garlic butter onto the flesh. Sprinkle with a little cayenne pepper. Remove from baking sheet, sprinkle with some chopped coriander and chilli and dive in right away! Nothing could be easier, n'est ce pas? I'm a HUGE fan of seafood. These broiled mussels sound full of flavor and I find that popping them in the oven really makes the flavor different than if you boil mussels in a pot with the usual wine-garlic combo. The other day I had the pleasure of trying broiled mussels that were topped with harissa (a hot chili pepper paste). My mouth is watering just thinking of it. I might have to try out your recipe and the harissa version and enjoy them both :) Thanks! PS - Wonderful pictures!